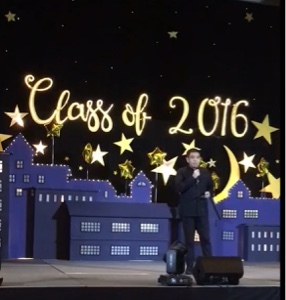 Speech at Primary School's Graduation dinner. Sunday, 5 June 2016. Good evening to fellow parents, and teachers of the graduating class. Congratulations to all Primary School graduates. A round of applause again to all od them please. To prepare for this brief talk, I asked my daughter, how she feels about graduating primary school? She said she is HAPPY, because she will be free of STRESS. She said that Secondary school will be more relaxed, because the teachers are also more relaxed. Primary school teachers who are here, please loosen up. Seriously speaking, we parents certainly don’t want our children to be stressed. Because life is meant to be enjoyed, not stressed upon. I think one of the causes of stress nowadays is Information Overload. In some ways, I am concerned for today’s children. When we parents were small kids, there was only 1 channel on TV and my favorite show at the time was DDB alias Dunia Dalam Berita at 9pm. After which was my bedtime. Life was simple. Back then, we did not have to worry.. did we use the right filter on that snap or IG post? Did he/she like my latest status update? We did not have any of those, and we came out relatively fine. Which means, graduates, all these advancement in technology is good, but they are not vital to your development as a person. Having said that, children nowadays still have to deal with at least 3 screens, small, medium and large. I.e. the phone, the tablet and the TV. These three screens have millions of content, some of which are good, and most of which are bad. With such information overload, it means the greatest asset that today’s children must have, is the ability to focus. For the graduates, I urge you to have fun in secondary school, while being able to focus on the important things. What are the important things? Number 1 will be family = lean on us, depend on us. We are there for you. Be confident that we want the best things to happen for you, even if some of our methods do not always seem right from your perspective. Number two would be your studies. Studying is not so much about grades, but about your ability to absorb, learn, and understand things. For you to be able to absorb, learn and understand, you have to be able to focus. Not just focus on instagram and snapchat, but also focus on family and your studies. This brings me to the final leg of my talk, which is the Pursue of Legitness. Legit is a word I hear a lot from my children. Someone who is legit, is very simply, someone who is real. A legit person acts in accordance to his/her own words, day in day out. Someone who is, well, legitimate. Whatever your goal and aspiration, pursue legitness. Because money does not make you legit. Neither does appearance, ..apalagi the latest gadgets. If you want to be an architect. Be a legit architect. If you want to be a dancer, be a legit dancer. If you want to be a legit boss one day, pursue legitness. Parents, to help our children in their pursue of legitness, and I am saying this to remind myself as well, we must also be legit parents. And each of us know what that means. To close, I want to congratulate all graduates, and all parents, again. Let's all of us pursue legitness, by enjoying life, focusing on our family, always absorbing learning and understanding, and be there for each other. I wish each and every one of you all the very best.